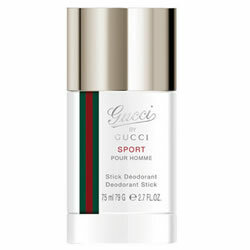 Gucci By Gucci Pour Homme Sport Deodorant Stick is gentle and effective. Gucci By Gucci Pour Homme Sport is a new, fresh, memorable and modern fragrance inspired by the Mediterranean Isles. Gucci By Gucci Pour Homme Sport has refreshing citrus and aromatic notes, such as grapefruit and cardamon, which blends with mouth-watering fig nectar and underlined by a deep patchouli note. Gucci By Gucci Pour Homme Sport also contains mandarin, cypress, juniper, vetiver and ambrette seeds for an unusual and masculine aroma.